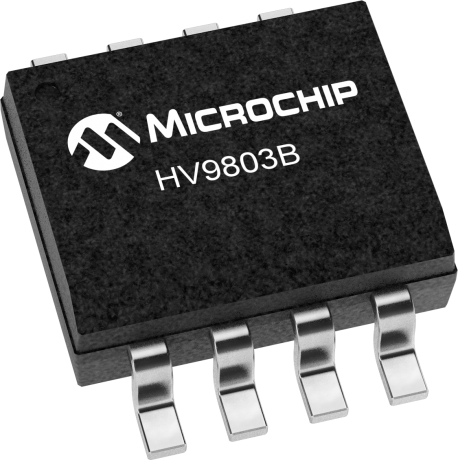 The HV9803B is an open loop average-mode current control LED driver IC operating in a constant off-time mode. The IC features ±2% current accuracy, tight line and load regulation of the LED current without any need for loop compensation or high-side current sensing. Its auto-zero circuit cancels the effect of both the input offset voltage and the propagation delay in the current sense comparator. The HV9803B can be powered from a 7.0 to 16V supply. The IC features fast PWM dimming response. The linear dimming input LD can accept a reference voltage from 0 to 3.0V. The IC is equipped with a current limit comparator for hiccup-mode output short circuit protection. It also features a programmable input under-voltage shutdown.